Home › Brain & Neurological › How important is fish oil? Have you heard the claims about omega-3 fatty acids through the advertising of everything from yogurt to dog food? 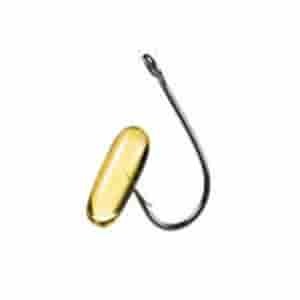 Omega-3 fish oil supplements are among the most popular supplements in the United States. Look through any health magazine and you are bound to find an ad for a fish oil product that touts various benefits, such as “Good For the Heart”, or “Better Brain Health”, or “Boosts Immune System” but does the science support claims like these or are they mostly hype? Fortunately for us, the science behind fish oil is just as exciting as the hype. Fish oil is extracted from the tissues of fish that contain omega-3 fatty acids. Fish do not actually produce omega-3 fatty acids on their own, but accumulate them from algae. Fish oil is so highly regarded because it contains large amounts of the two most desirable types of omega-3 fatty acids – eicosapentaenoic acid (EPA) and docosahexaenoic acid (DHA). Just like fish, our bodies can’t make omega-3 fatty acids on their own, so we must get them through food and supplementation. Our dietary consumption of omega-3s comes from both animal sources, such as fish or krill, and plant based-sources, like walnuts, flax or chia seeds. The problem with plant-based sources is that they mostly give us an omega-3, called alpha-linolenic acid (ALA), which is then inefficiently converted into EPA/DHA by the body. Fish oil is a supplement that serves as a convenient way to provide our body with the most absorbable and useful kinds of omega-3 fatty acids. Omega-3 fatty acids are required throughout the body for a wide array of essential functions. They play a key role in cell membrane health and development and give the body the materials it needs to make hormones that do everything from regulating blood clotting to the contraction and relaxation of artery walls. A recent study published in The British Journal of Cardiology found populations that eat EPA/DHA-rich fish also have lower rates of coronary heart disease and sudden cardiac death. Perhaps the most important role for omega-3s is reducing harmful inflammation, the kind that isn’t healing wounds or infections but is instead damaging healthy cells, within the body. Although EPA and DHA work together, they each have their own unique actions and purposes. DHA is an essential building block in the brain for neurological and visual development and, as the most abundant fatty acid in the brain, adequate amounts of DHA are needed throughout infancy and adulthood for optimal mental function. Research from the journal Pharmacological Research confirms DHA’s role in brain health and concludes that DHA is required for the maintenance of normal brain function and that decreases in DHA are associated with depression and cognitive decline. EPA is the part of omega-3 fatty acids most responsible for the anti-inflammatory benefits. A recent study from Brain, Behavior and Immunity demonstrated how EPA boosts the body’s immune response by reducing the amount of inflammatory proteins in the body and helps the body cut off inflammation once an infection has been healed and the inflammation is no longer needed. This is important due to our excessive consumption of another kind of fatty acid, omega-6. What Are the Differences Between Omega-3s and Omega-6s? EPA and DHA work together to even the body’s ratio of fatty acids by giving us more of the rarer omega-3s to balance out the more abundant omega-6s. Omega-6 fatty acids are similar to omega-3s in that they are essential to our health and the body cannot make them on its own. Like omega-3s, omega-6s give your body the materials it needs to perform essential cellular and biological processes. Omega-6s help stimulate skin and hair growth, maintain bone health, and are necessary for proper metabolism and maintenance of the reproductive system. Omega-6s also help with wound healing by supporting the creation of inflammatory hormones – an important part of the immune response. By evenly balancing omega-6s with -3s, we get the positive benefits of both while the anti-inflammatory omega-3s make sure that inflammation from omega-6s is held in check. A study published in Biomedicine & Pharmacotherapy was just one of many that have confirmed the importance of balancing omega-3 and -6 levels by finding that getting more -6s than -3s leads to runaway inflammation, cardiovascular disease, cancer, and autoimmune diseases. It is easier said than done to keep our omega fatty acid levels in balance, though. Before the industrial revolution, our ancestors ate a balanced ratio of about 1:1 omega-6s to -3s since their diets consisted of a lot of omega-3-rich fish and nuts. After the revolution, our intake of omega-6s skyrocketed since people started consuming more grains and vegetable oils. Recent studies, such as one published in Biochemical Pharmacology, find that people eating today’s Western diet typically get far too many omega-6s. The study discovered that some people consume 25 times as many omega-6s as they do -3s. Omega-6s are typically acquired in large amounts through highly-refined carbs, cereal grains, and vegetable oils such as sunflower, soybean, peanut, and corn. It’s very hard to avoid omega-6s in today’s world, and we wouldn’t want to completely avoid them even if we could, so the best way to bring our omega fatty acid levels into balance is by increasing our intake of omega-3s and improving our diet to avoid an excess intake of omega 6s. Fish is a good source for easily absorbed, useful omega-3 fatty acids. Not only is fish a good way to get the EPA/DHA you need, but fish is high in other vitamins and minerals such as vitamin D and selenium. Unfortunately, some people just cannot realistically eat as much fish as would be needed to reach their desired levels of omega-3s. A study published in the Journal of the American Medical Association found that eating one to two servings of EPA/DHA-heavy fish a week gives us the minimum amount we need to see significant health benefits. But if you would like a stronger dose, and are someone who doesn’t want to eat fish three or more times a week, supplementing with fish oil is the best way to get enough EPA/DHA to ensure that your intake ratio of omega-6s to -3s stays as close to 1:1 as possible. Be careful, though, because not all fish oil supplements are created equally. Fish oil is a delicate substance that can easily go bad if directly exposed to oxygen or sunlight or processed incorrectly. If the fish oil manufacturer’s production process does not extensively test for purity, you may be doing more damage than good by using rancid fish oil or fish oil that may contain heavy metals and other contaminants. It’s never a good idea to get fish oil supplements from a big-box store or a discount retailer unless you know and trust the company it came from. Here at Oakway Naturals, we only carry brands that perform thorough testing and adhere to the highest standards for purity. 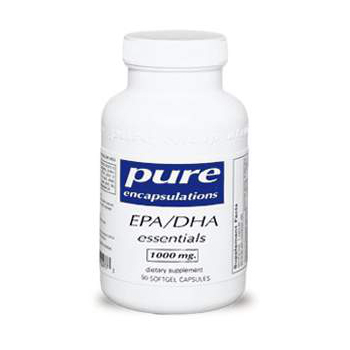 But out of all the top-notch fish oil supplements out there, one of my favorites is EPA/DHA Essentials by Pure Encapsulations. Pure Encapsulations gets the fish oil for this supplement from omega-3-rich sardines and anchovies off the cold-water coasts of Chile and Norway. OmegaGenics EPA-DHA 720, by Metagenics, has similarly excellent sources and is also a great option. A study from Oregon State University looked at EPA/DHA content in fish and found that cold-water fish like anchovies and sardines tested higher than warm-water fish like bass and perch. It is believed that living in cold water environments forces fish to have a higher fat concentration, which leads to more omega-3 content. Smaller fish like sardines and anchovies are also ideal because they are lower on the food chain and typically have fewer contaminants in their oil than oil that comes from bigger fish. For those who prefer a liquid form, I like the ProOmega by Nordic Naturals for similar reasons. If you’d like to learn more about how inflammation is at the root of many chronic illnesses, and how omega-3 fish oil has the remarkable ability to reduce cellular inflammation and drastically improve your health please, read my article How Long Term Inflammation is Hurting You Now. I hope this information is useful to you, and if you have any questions regarding the concepts discussed here or anything else, you can reach our customer service team at customerservice@oakwaynaturals.com or you can call them at 888-460-3091. EPA and DHA from fish oil promote cardiovascular health by supporting healthy triglyceride and lipid metabolism, maintaining healthy blood flow, and supporting healthy platelet function. Fish oil is also important for optimal joint function. It maintains healthy prostaglandin and leukotriene production, which is important for maintaining connective tissue health and comfort. A recent study found populations that eat EPA/DHA-rich fish also have lower rates of coronary heart disease and sudden cardiac death. Perhaps the most important role for omega-3s is reducing harmful inflammation, the kind that isn’t healing wounds or infections but is instead damaging healthy cells, within the body. Although EPA and DHA work together, they each have their own unique actions and purposes. DHA is an essential building block in the brain for neurological and visual development and, as the most abundant fatty acid in the brain, adequate amounts of DHA are needed throughout infancy and adulthood for optimal mental function. Research from the journal Pharmacological Research confirms DHA’s role in brain health and concludes that DHA is required for the maintenance of normal brain function and that decreases in DHA are associated with depression and cognitive decline. EPA is the part of omega-3 fatty acids most responsible for the anti-inflammatory benefits. A recent study demonstrated how EPA boosts the body’s immune response by reducing the amount of inflammatory proteins in the body and helps the body cut off inflammation once an infection has been healed and the inflammation is no longer needed. Omega-6s help stimulate skin and hair growth, maintain bone health, and are necessary for proper metabolism and maintenance of the reproductive system and also help with wound healing by supporting the creation of inflammatory hormones – an important part of the immune response. By evenly balancing omega-6s with -3s, we get the positive benefits of both while the anti-inflammatory omega-3s make sure that inflammation from omega-6s are held in check. Omega-6s are typically acquired in large amounts through highly-refined carbs, cereal grains, and vegetable oils such as sunflower, soybean, peanut, and corn. We wouldn’t want to completely avoid them even if we could, so the best way to bring our omega fatty acid levels into balance is by increasing our intake of omega-3s and improving our diet to avoid an excess intake of omega 6s. Be careful, though, because not all fish oil supplements are created equally. If the fish oil manufacturer’s production process does not extensively test for purity, you may be doing more damage than good by using rancid fish oil or fish oil that may contain heavy metals and other contaminants. Here at Oakway Naturals, we only carry brands that perform thorough testing and adhere to the highest standards for purity. But out of all the top-notch fish oil supplements out there, one of my favorites is EPA/DHA Essentials by Pure Encapsulations. Pure Encapsulations gets the fish oil for this supplement from omega-3-rich sardines and anchovies off the cold-water coasts of Chile and Norway. OmegaGenics EPA-DHA 720 has similarly excellent sources and is also a great option.